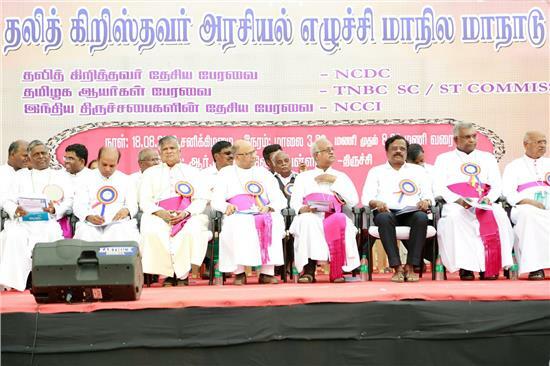 A state level public meeting was held at Trichy town, Tamil Nadu, jointly organised by Tamil Nadu Bishops’ Council ( TNBC) Commission for SC/ST, National Council of Churches in India (NCCI) and National Council of Dalit Christians (NCDC) in which more than 10,000 people participated. Catholic and Protestant Bishops, Dalit Christian leaders and Christians from many parts of Tamil Nadu participated in the public meeting. Most Rev. Antony Pappusamy, President of TNBC, Most Rev. Neethinathan, Vice President of TNBC, Most Rev. P. Thomas Paulsamy Chairperson for the TNBC Commission for SC/ST, Most Rev. Devadass Ambrose, Administrator of Trichy diocese, Most Rev. Thomas Aquinas, Bishop of Coimbatore, Most Rev. Chinnappa, Archbishop Emeritus of Madras-Mylapore, Protestant bishops, Fr. Devasagayaraj, Secretary to the CBCI Office for SC/BC, Mr. Franklin, Advocate, NCDC leaders and other Dalit Christian leaders addressed the gathering. The Christian community will support and vote for the parties who support our demand of Scheduled Caste rights to Dalit Christians and address the same in their election manifesto of 2019 Lok Sabha election. The Christian community will disown the parties and their alliances in the forthcoming Lok Sabha election that do not support the right of Dalit Christians to be included in the Scheduled Caste list. Dr. Mary John the President of NCDC Tamil Nadu chapter presided over the meeting. Fr. Kulandainathan, Secretary to the TNBC Commission for SC/ST, the Diocesan SC/ST commission secretaries, Regional and diocesan SC/ST commission coordinators and Mr. E.D. Charles took care of the logistics of the program. After the Hindus, Christians are the second largest religious community in Tamil Nadu who constitute 6.12% whereas Muslims constitute 5.86% of the population.